To welcome visitors from Shanghai, across China and around the globe to Auto Shanghai, Shanghai Disney Resort is offering a special Disneyland entry ticket for all show visitors, exhibitors and media. The special ticket gives show visitors and participants access to Shanghai Disneyland following a great day visiting or working at the exhibition, with entry valid from 3:00 pm on any pre-selected date during the April 16-26 promotion. Shanghai Disney Resort is the world's newest Disney resort, with the resort's Shanghai Disneyland theme park featuring seven themed lands brimming with immersive experiences and attractions sure to excite auto fans and Disney lovers alike. This spring, Shanghai Disney Resort also has an incredible lineup of unique seasonal offerings for guests to experience while visiting the city. The Auto Show Special – Shanghai Disneyland Ticket include entry to the park from 3:00 pm on any pre-selected date during the April 16-26 promotion period. The standard ticket starts from just RMB 199, with a discount option for children under 1.4 meters, senior guests aged 65 or older, and guests with disabilities starting from RMB 149. Tickets will go on sale on April 16 on the Shanghai Disney Resort Reservation Center (Hotline: 400-180-0000 or +86-21-3158-0000 Chinese and English language service) and the official Shanghai Disney Resort WeChat Account; beginning April 18 and through April 26 guests can also purchase the tickets on the resort's official website and app. Guests will be able to see details of the offering on Shanghai Disney Resort light box displays inside the auto show venue and can purchase tickets by scanning the QR code directly. Shanghai Disney Resort also offers world-class accommodations for Auto Show visitors who want to make the most of their experience in and around the resort, or spend some extra days exploring the magic in Shanghai. The elegant Shanghai Disneyland Hotel offers a taste of luxury, elegance and enchantment, with first rate rooms and dining offers—including entertaining character dining in Lumiere's Kitchen. The Toy Story Hotel, inspired by the amusing toys of the hit animated film series, offers themed rooms featuring playful touches, bountiful family-friendly activities and delicious dining—all just steps away from Shanghai Disneyland. Guests visiting during Shanghai Auto will even have the unique opportunity to check out the resort's first-ever International Food & Drink Fest—taking place April 12 through May 4. The festival features a world of flavors, giving guests the chance to indulge in delectable dishes, snacks and drinks from international food market booths serving up regional cuisine from Hawaii to the Middle East, Italy to Seoul, and everywhere in between, with menus offering fresh, healthy ingredients as well as a range of non-alcoholic beverages, beer, wine and cocktails. Guests also can explore their passion for food with interactive cooking classes and live demonstrations, plus surprise visits from Chef Donald. 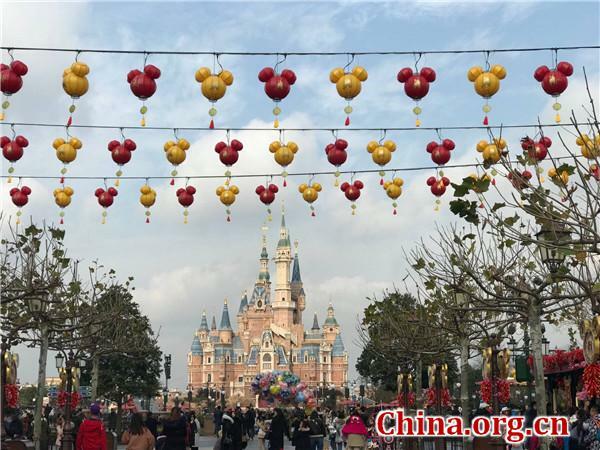 ​To welcome visitors from Shanghai, across China and around the globe to Auto Shanghai, Shanghai Disney Resort is offering a special Disneyland entry ticket for all show visitors, exhibitors and media.